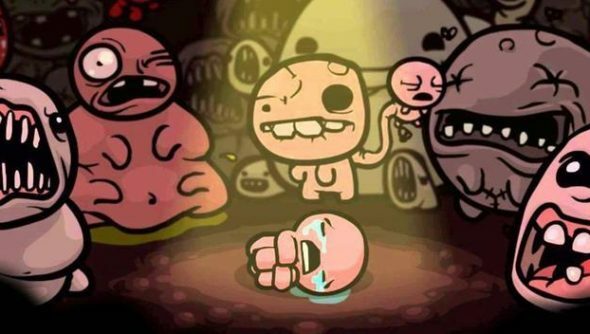 Update, June 13: Ok, so Edmund McMillen might not be making a Binding of Isaac battle royale. It looks like an announcement for a new The Binding of Isaac project is imminent. The creator of the roguelike indie classic, Edmund McMillen, says the game is “kinda” happening. If you’re not familiar with The Binding of Isaac, it’s a top-down roguelike in which players control a baby, Isaac, who defeats dungeon-loads of monsters with his tears. A remake, The Binding of Isaac: Rebirth, was released in 2014. Now, the game’s creator says he’s working on a new game, to be announced next week. McMillen initially joked that that it would be a battle royale, but has since clarified that that’s not actually what he’s working on. Here’s a list of the best indie games on PC. To that, McMillen simply replied “kinda,” which suggested that his next project could be a battle royale. Honestly, I could have seen that working – the need for power-ups is key in Isaac, and it’s possible that a few players could spawn into a dungeon and fight it out for the top spot. All that said, it was all a bit of a ruse on McMillen’s part (one that I fell for pretty hard) – last year he tweeted that “I have a rough design for an Isaac casual 2-4 player card game I’ve been messing with, we will see what happens next year.” That was nearly eight months ago, meaning it’s very possible that this card game will actually be the next project.